'iPad Mini' Design Change Halts Production by Case Manufacturers? Over the past several months, numerous cases and physical mockups for Apple's rumored "iPad mini" have leaked, offering what many have believed will be a good approximation of what the device will actually look like. But according to a brief report from Mac Otakara, those case manufacturers may now need to shift gears as one company has reported that it has halted production on its iPad mini cases due to an unspecified design change. Large OEM mobile accessory maker has stopped their iPad mini case production, because the form of iPad mini seems to be changed. 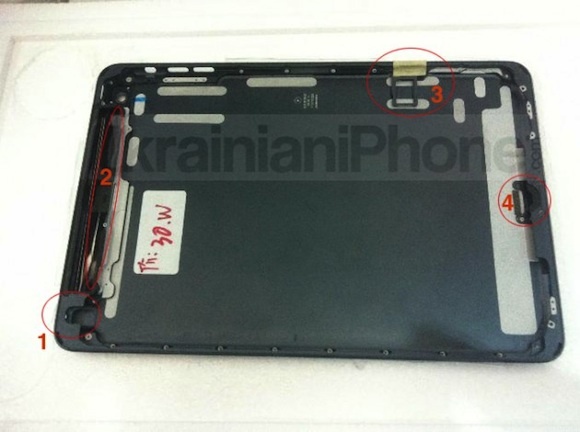 Source told me the round shape seems changed, then case designed based on leaked iPad mini may be dropped. Case designs have historically been quite accurate in predicting the overall design of Apple's products, with the major exception of 2011's tapered "iPhone 5" design that never came to pass as Apple ultimately released the iPhone 4S with essentially the same design as the iPhone 4. It is unclear, however, exactly what may have changed with the iPad mini's design. Alleged part photos showing the rear shell and front panel have surfaced looking very much like the design generated by case manufacturers, but it is unknown whether those parts are actual production parts or perhaps older ones from prior to the design change. Even so, the design change may simply be a small tweak that may not be immediately obvious in low-resolution parts photos but significant enough to cause problems for case manufacturers trying to get a head start on the iPad mini launch. If the big iPad is $499, and the iPod Touch is $299..
Will the iPad mini be $399?!?!?!??!?!!!??!?!?! No, $299 for either the iPod or the iPad Mini. iPod gives you retina and more drive space. iPad Mini gives you more room to work but less resolution and less storage space. New Trend: IT DOES NOT EXIST. Kidding, but that would be funny. This is the dumbest logic. One is a personal media player and one is a tablet. I'm not going to strap my Nexus 7 onto my arm and go for a jog, will I? It's like you're saying, "Why buy a $299 bike when I can buy an iPod for that price!" Different devices have different use and functions. I see anything can be front page news now.